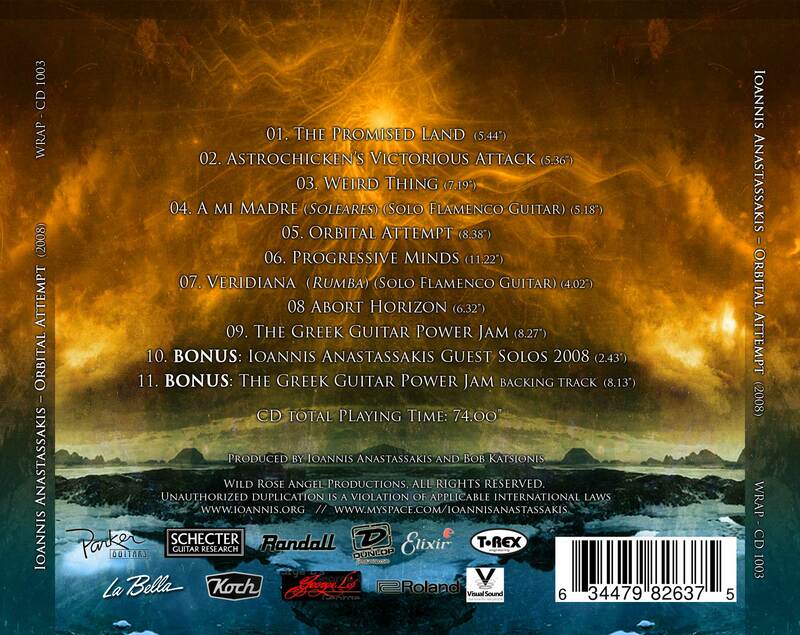 Kiko Loureiro (Angra) and Brett Garsed and the epic keyboard work of Bob Katsionis (Firewind). A variety of styles and textures of Contemporary Guitar music – Fusion, Progressive, Metal & Solo Flamenco! 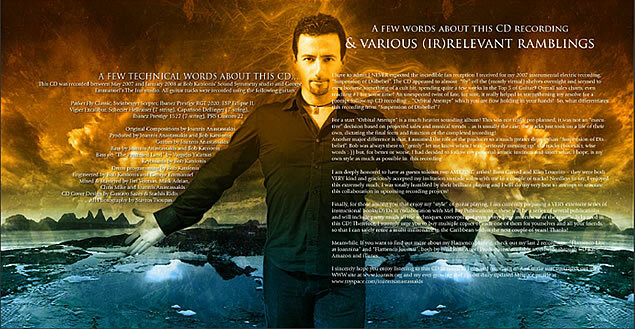 CD also includes: 2 BONUS tracks and BACKING track packaged in a see-through CD case, complete with the 8-page full-color insert including detailed track info and detailed performance notes! I have to admit I NEVER expected the incredible fan reception I received for my 2007 instrumental electric recording, “Suspension of Disbelief”. The CD appeared to almost “fly” off the (mostly virtual) shelves overnight and seemed to even become something of a cult hit, spending quite a few weeks in the Top 5 of Guitar9 Overall sales charts, even reaching #1 for some time! An unexpected twist of fate, for sure, it really helped in strengthening my resolve for a prompt follow-up CD recording – “Orbital Attempt” which you are now holding in your hands! So, what differentiates this recording from “Suspension of Disbelief”? 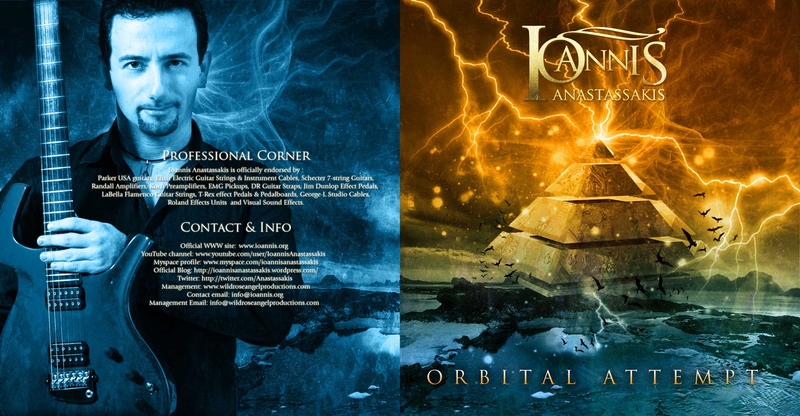 For a start “Orbital Attempt” is a much heavier sounding album! This was not really pre-planned, it was not an “executive” decision based on projected sales and musical trends – as is usually the case, the tracks just took on a life of their on, dictating the final form and function of the completed recording! In this CD recording, I am deeply honored to have as guests soloists two AMAZING artists! Brett Garsed and Kiko Loureiro – they were both VERY kind and graciously accepted my invitation to trade solos with me in a couple of tracks! Needless to say, I enjoyed this extremely much, I was totally humbled by their brilliant playing and I will do my very best to attempt to reiterate this collaboration in upcoming recording projects! 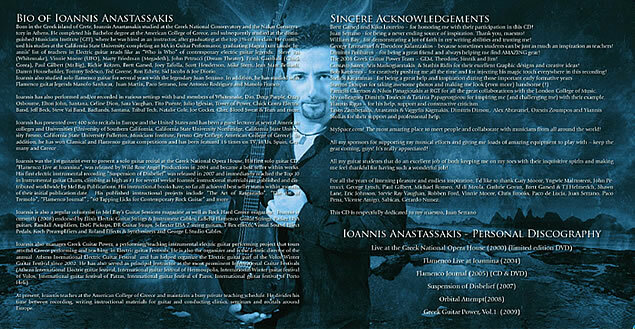 Meanwhile, If you want to find out more about my Flamenco playing, check out my last 2 recordings: “Flamenco Live at Ioannina” and “Flamenco Journal”, both by Wild Rose Angel Productions, available worldwide through CD Baby, Amazon and iTunes . This is one of my favorite tunes on this CD! The intro is a series of flowing sweep-picked arpeggios that set the mood for the melody that follows – The Latin-influenced rhythm at 2.00 was definitely inspired by all those Al di Meola 70s fusion tracks. Highlights: Trading solos with the AMAZING Kiko Loureiro from Angra !!! Enough said!! A melodic, driving rocker, that builds up relentlessly! Based on a very simple melodic idea, this track soon became one of my favorites. Probably 80-85% of the lead guitar was done on a single take, (while Bob was shamelessly devouring a warm pizza), using an Ibanez 7-string with the notable exception of the final guitar/keyboard duel! Highlights: The final guitar/keyboard duel was one of the MOST fun parts to record in the whole CD! MANY thanks to my talented good friend and former electric guitar student Tasos Varkas for the original idea of the tune and for coming up with the amazing title! I always has a soft spot for well-crafted AOR songs by “hair metal” bands, like Tyketto, Dokken, Fifth Angel and Danger Danger. As a result, I always wanted to write an AOR instrumental! “The Promised Land” started as a dead-simple-but-pretty-catchy improvised main riff, but developed very quickly! The guitar solo/Interlude at “4.50” was done in one take and then harmonies were added. The idea of having a “break-up” solo just before the harmony interlude was “lifted” from all the famous 60s & 70s British classic rock bands! Highlights: The “fake-George-Lynch” solo at “3.42’’-3.58’’”. I really would have loved to have the real George play in the track with me, but I knew I would have no luck getting him to commit something to (virtual) tape – so, instead, as an homage to his amazing talent, I decided to play a solo in his early (mid 80s) style! SHRED ALERT: The solo immediately after the “fake-George-Lynch” solo features an extreme sampling of the techniques I use in my playing, in just a few seconds! 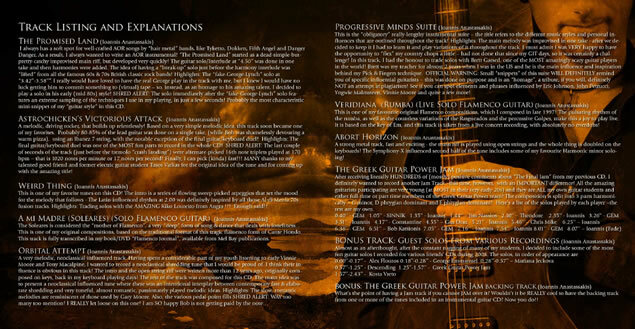 Probably the most characteristic mini-snippet of my “guitar-style” in this CD. The Soleares is considered the “mother of Flamenco”, a very “deep” form of song & dance that deals with loneliness… This is one of my original compositions, based on the traditional format of this tragic flamenco form of Cante Hondo. This track is fully transcribed in my book/DVD “Flamenco Journal”, available from Mel Bay publications. This is the “obligatory” really-lengthy instrumental suite – the title refers to the different music styles and personal influences that are outlined throughout the track! Highlights: The main melody was improvised in one take – after we decided to keep it I had to learn it and play variations of it throughout the track. I must admit I was VERY happy to have the opportunity to “flex” my country chops a little – had not done that since my GIT days, so it was certainly a challenge! In this track, I had the honour to trade solos with Brett Garsed, one of the MOST amazingly scary guitar players in the world! Brett was my teacher for almost 2 years when I was in the US and he is the main influence and inspiration behind my Pick & Fingers technique. A very melodic, neoclassical-influenced track. The intro and the open string riff were written more than 12 years ago, originally composed on keys, back in my keyboard-playing days! The rest of the track was composed for this CD. The main idea was to present a neoclassical influenced tune where there was an intentional interplay between contemporary fast & elaborate shredding and very tuneful, almost romantic, passionately played melodic ideas. Having spent a considerable part of my youth listening to early Vinnie Moore and Tony Macalpine, I wanted to record a neoclassical shredding tune that I would be proud of. I think their influence is obvious in this track! This is one of my favourite original Flamenco compositions, which I composed in late 1997! The pulsating rhythm of the rumba, as well as the countless variations of the Rasgueados and the percussive Golpes, make this a joy to play live. It is based on the key of Em, and this track is taken from a live concert recording, with absolutely no overdubs! A strong metal track, fast and exciting – the main riff is played using open strings and the whole thing is doubled on the keyboards! The Symphony-X influenced second half of the tune includes some of my favourite Harmonic minor soloing!